Oh the stories I've heard about what happens when you eat too many tunas. I'm not going to share the specifics, because can I just say...it's not pretty. When Mexi was just a wee niño, he and his cousins had tunas at their fingertips (not to mention the nopales/cactus paddles that go hand in hand...how cool! ...says the girl raised in the Midwest). 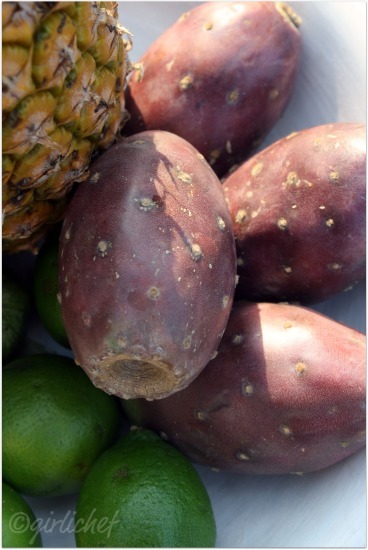 Tunas, otherwise known as cactus fruit or prickly pears are fabulously juicy and refreshing hot weather treats. The purple variety stain your hands as if you were handling peeled beets or berries, yet they taste like a cross between a watermelon and a cucumber (to me, at least). The pesky part comes in the seeds that run throughout the fruit. Usually you just swallow them...but to make some long stories short, if you're going to swallow the seeds, don't eat more than a couple of tunas at a time. Or your drain will get clogged. Which may lead to painful doctor visits. I've always heeded this warning because said stories conjure up some painful thoughts...and I am NOT going there. That said, if you blend them and strain out the seeds, you have nothing to fear. No little hard pellets to get stuck anywhere unpleasant. Enough said? 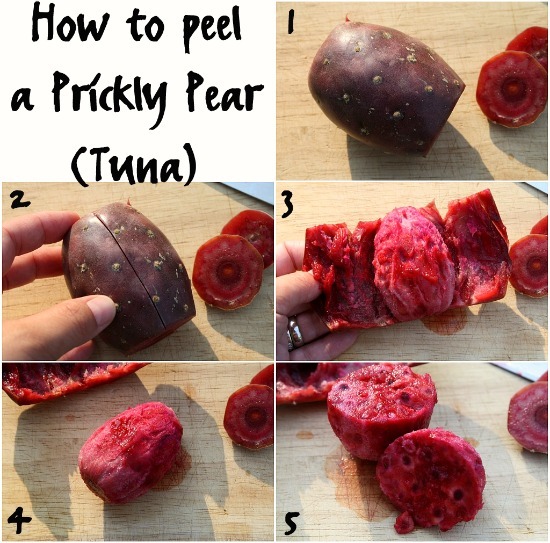 Peel your tunas (prickly pears), halve them and throw them into the blender with a couple of the cups of water; purée until smooth. 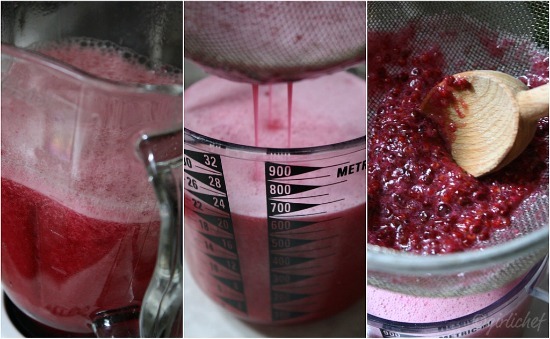 Strain through a sieve into a pitcher to remove the seeds and pulp. Stir in remaining water and sugar. Adjust water (and/or serve it over ice) and sugar amounts to suit your tastes. I love Agua de Tuna, but tunas don't last long enough in my house to make it. :P Hubby loves the purple tunas in Pico de Gallo with chile habanero. My 6 year old son bought a bag of orange/yellow tunas today. Delicious! I take these kinds of warnings very seriously...thanks for letting me know. First time I've seen a prickly pear, I would like to try one! I came across your blog on Balancing Beauty & Bedlam...I love it Prickly Pear everything! Jam, Margaritas, Ice Pops, and now I can't wait to try the water! My mom has some large cactus that produce a lot of prickly pears, so we have them available! YUM! I've often seen these in the grocery store and wondered what to do with them. Now I know, and will heed your warning. :) This has such a beautiful color, and sounds very refreshing! How did you get the thorns off the prickly pear fruit? I've pinned this as something to make when visiting my MIL in Palm Coast, FL. I love the prickly pear syrup we got in New Mexico and would love to try this fresh prickly pear water - I have seen the prickly pears a few times in my store, should pick them up soon to try! I totally thought you meant the fish when this first popped up in my google reader. Thankfully...not so much. Sounds super refreshing! @Miko's Girl...I thought about this after I posted. I'm fortunate in that my Mexican market sells them thorn-free. But hubby says just hold them with a glove and whack 'em (carefully) off with a paring knife...although, they just used to use little "brooms" made of grasses and swipe it against them to get them off. You could also rub it on the grass...now this is what they did to eat them when they picked them straight from the cactus. If you get them from the market, just rubbing them off or using a small knife may be the easiest bet. Let me know what you try! Oh my, this looks so cool and refreshing! Thanks for the warning...I hadn't heard that, but of course I haven't known anyone first hand that has had that happen to them either :) I have some on my prickly pear cactus right now and I was wondering about trying them. Didn't know they were called tunas, thought they were cactus pears. I think mine are white inside, or maybe that's my other cactus fruit. I've tried the pads and they are a pain to clean, even in our market they are still with the stickers! Thanks for such a great post! Never tasted before. Your click makes me crazy to try this. I see them in local fiesta store but not yet got courage to buy them. Looks delicious. Next time, if i get adventurous sure buy and try this. First time I have seen a prickly pear, I am planning to try it on this weekend. The drink looks so refreshing and cool. I live in Tucson where the prickly pear grows wild. I'm going to try this. I would love it if you came by my Cast Party Wednesday Link Party tomorrow and shared some of your recipes with us. 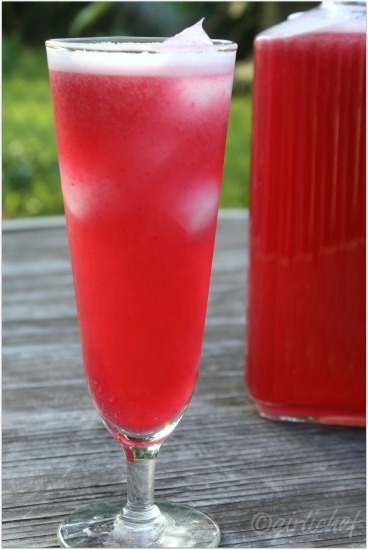 Such gorgeous color, a lovely drink. I have been enjoying and posting about various melon agua fresca drinks and now I need to try this one. love this agua de tuna...I purchased some tunas yeaterday and man I had thorns EVERYWHERE!! lol love the color!! I'd never had these until I met my husband. He said he ate them all the time in his country. He remembers his mom and sister peeling tons of them and pricking their fingers (I'm not sure what they were making with them, I guess I should ask!). Well...I had no idea! I thought it sounded gross....since I thought it had to do with fish..ha. I wonder if I can buy those at Central Market or Whole Foods. They sound delicious but I have never had them. Yum! Such a gorgeous color and it looks so refreshing--which is good because it looks like you might need it after prepping the prickly pears. ;-) I need to look for these at my Latin Mercantile. Ha the the minefields we traverse to have the things we love... I've never had Agua de Tuna but am looking forward to trying it asap! Well, you definitely have me convinced to give Tunas another try. I haven't had them in years -- tried them when I was a kid, but was daunted by the seeds without even knowing they could cause troubles down below. I'm going to look for some at my next farmers' market and give your recipe a try. So wonderful to have a culinary talent of your caliber link up to "A Little Birdie Told Me..."! Thanks! That drink looks so refreshing! I saw some green prickly pears before but I don't know how they taste like.. I love tunas but I haven't prepare agua de tuna! My husband bought some green tunas, mmm delicious! If you add some lemon juice, will it hold longer?